I drive through Blaine and Point Roberts looking to share the localized humor and wisdom I see in this weekly column with you. Recently while traveling roads through my old home of Skagit County this billboard stood out against the skyline proclaiming a profound universal knowledge and philosophy. I felt compelled to share its deeper meaning with you during the 2005 holiday season. Christmas is most often remembered as the time when families gather around lighted and decorated trees opening gifts and feeling unusually warmhearted to almost everyone at the dinner table. Christmas is meant to be the season we search our souls to find love and understanding for others. People of all faiths are encouraged to pray for peace to come on earth for all mankind (and womankind too). 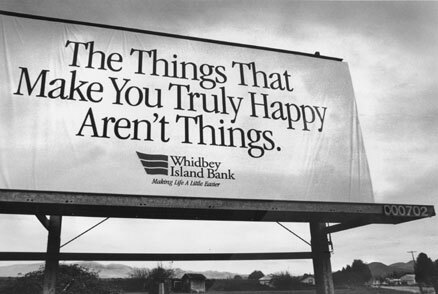 This astute billboard, supported by a financial institution, risks everything to put aside the importance of possessions asking us to consider the truer meanings of life. The philosophical message points out the significance of making time to acknowledge everyday moments, thoughts and sensations. When we appreciate ourselves and others we really see the world God created.